Store Credit: Can I Rebuild My Credit With Store Credit Cards? If you have recently declared bankruptcy or gone through some major life change which threw your credit score through a loop, you are probably obsessing about that all-important three digit number. How do you get it back to where it used to be, or if you never had good credit, how do you reach that magical 720 when you’re stuck sitting here in the gutter of 300’s? One of the key points to rebuilding your credit is to get a good and lengthy credit history. In other words, you want credit accounts which have been open for a long time without any late payments. You will also want to use less than 30% of your total credit limit at any given time. These two factors together with the healing properties of time will eventually get your credit score closer to what you want - but make no mistake, depending on your personal situation, it could take a year or more before you see significant upward movement in your credit score. Video: Know Your Credit Score! 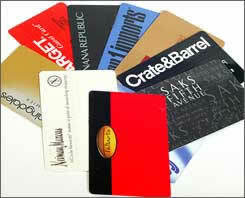 Store credit cards often provide a shining light out of the credit score gutter, but not without a cost. Although they are typically much easier to get than a bank-issued credit card, the interest rate on store credit is usually much higher, and unless you can get a co-branded card with a Visa, American Express, or MasterCard logo, you will be pretty limited on what and where you can purchase things. However, cards without the co-brand are easier to obtain, and a lot of stores without the co-brand charge the same interest rate to everyone, regardless of their credit history. Another downside to store credit cards are their low limits. In order to keep that credit score going up, you will have to be pretty careful not to spend more than 30% of your total credit limit. All the while, you should definitely keep in mind that you are trying to rebuild your credit. Pay off the entire balance of the card each month - not only will you save a good chunk of change by not paying their high interest rates, you will also make sure that debt doesn’t get out of control again. If you’re rebuilding your credit, then chances are your credit isn’t all that pretty right now. Any kind of unsecured credit is going to cost an arm and a leg, while secured credit will just cost an arm. A debt consolidation loan probably wouldn’t be a good idea at this time, since the goal is to get a lower rate of interest on your debts, and with bad credit that isn’t likely. Better options include a secured credit card or a secured loan. Approval is pretty easy and you have little chance of messing up your credit since you can close the account and withdraw the balance if you can’t pay the bill. Some people take a chunk of their tax return to open up secured accounts, so if you don’t have the cash now just be patient.